"Guns. Suits. Cookies. Urban fantasy for geeks." Twenty years ago, Stef Mimosa died, but that’s OK, she got better. Now, she’s a code monkey for hire, doing a bit of hacking on the side. This is fortunate as Dorian Gray is looking for code monkeys to work on an usual code, one that could reunite a monster with the woman he loves. After things go awry, Stef comes face to face with the man who brought her back from the dead - a man she’s always thought of an angel, which…technically he is. He recruits her, and shows her the world of magic around her - one filled with freaks, monsters, talking trees, undead mermaids and an entire department who have alarms that go off when their favourite webcomics update, and shows her that even a crazy, scared, directionless geek who relies on the voice in her head can have a place in the world. Mirrorfall has not been tagged yet. 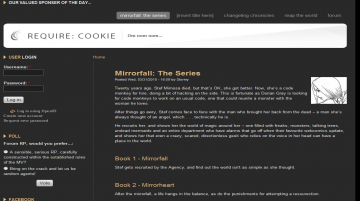 Help others find Mirrorfall by tagging it! This is the first book in the Mirrorverse, a very original and well-founded ‘verse. In this book our asocial little hacker girl Stef (Spyder) is being introduced with the Agency and Solstice, in a rather harsh way. The ending of this book, though very surprising, is just amazing. What happens in between I can’t really say much without spoiling… but trust me when I say it’s rather exciting. Mirrorfall has not been recommended yet.